"When I travel around the country, meeting with students, business people, and others interested in the economy, I am occasionally asked for investment advice…I know the answer to the question and I will share it with you today: Education is the best investment." One of the most important investment decisions you will ever make is the decision to invest in yourself. You might think that investment is only about buying stocks and bonds, but let's take a step back and consider investment a little differently. Economists use the word investment to refer to spending on capital, which can be either physical capital (tools and equipment) or human capital (education and training). Let's briefly look at each type. A firm invests in itself by buying capital that it uses to improve what it does. In other words, it invests in physical capital to earn higher profits in the future. For example, a firm might invest in new technology to increase the productivity of its employees. The increased productivity raises future revenue (income earned by the firm) and profits (revenue minus costs of production). Seems like an easy decision, right? Well, before a firm invests in physical capital, it must consider three very important points. First, a firm invests in technology now with the expectation that it will lead to higher revenue and expected profits in the future. But this expectation might not be realized. For example, the technology might not increase productivity as much as the firm expected. Or the demand for the good the firm produces might decrease, resulting in less revenue than expected. Second, a firm considers other investment alternatives. A firm can invest in many ways to raise future profits. For example, maybe investment in technology A results in profits, but investment in technology B, which is more expensive, leads to much larger profits. Third, a firm also considers the potential return on investment (ROI). The ROI is a performance measure of the effectiveness of an investment. It is calculated as the net gain (gain from investment minus cost of investment) divided by the cost of investment. A firm compares the expected gain with the investment cost to make a sound decision. Of course, the result of any investment lies in the future and must be projected. Predicting the future is always tricky; therefore, any uncertainty about the result must also be considered. Investment in human capital is the effort that people expend to acquire education, training, and experience. People invest in their human capital for the same reason a firm invests in physical capital: to increase productivity and earn higher income. An added benefit is the increase in job opportunities for those with more education: The unemployment rate for those with a bachelor's degree is 4.1 percentage points lower than for those with only a high school diploma (see the first graph). Of course, higher education is expensive. To increase the likelihood that the investment will pay off, let's consider three points. NOTE: In December 2011, the unemployment rate for those 25 years of age and older with at least a bachelor's degree (blue line) was less than half that for high school graduates of the same age with no college (red line). SOURCE: Federal Reserve Bank of St. Louis FRED. 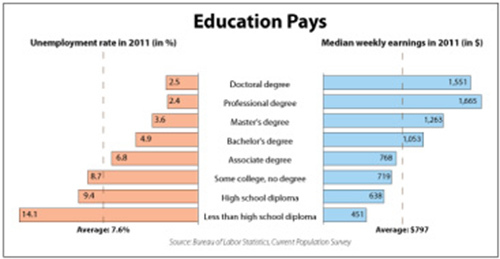 NOTE: In 2011, median weekly earnings for those with a bachelor's degree were $1,053; median weekly earnings for those with a high school diploma were $638. Second, people should consider what kind of an investment to make. Getting an education will most likely lead to higher income, but there are vast differences in the projected income and job opportunities of the various courses of study available. For example, according to the Bureau of Labor Statistics (BLS), an elementary schoolteacher with a four-year degree earned $51,380 (median) in 2010,3 while a computer programmer with a four-year degree earned $71,380 (median) in 2010.4 Both earned a higher income than they would have if they had not acquired a college degree, but the difference between the median earnings is significant. The job opportunities available in different professions also vary. The BLS forecasts job outlooks for various occupations. For mechanical engineers (2010-20), the BLS forecasts job growth of 9 percent,5 while for registered nurses job growth of 26 percent is expected.6 Again, there is a significant difference. Given these facts, does that mean that you should not become an elementary schoolteacher? Does it mean that you should consider only computer programming or nursing? No, but the median income and the expected job growth rate are two factors to consider when making decisions about future education and training. In fact, there are many opportunities to gain training and valuable job skills besides the usual college route. Vocational, technical, and trade schools teach specific, practical jobs skills that can lead to a good job within 2 to 4 years. For example, many such schools offer programs in computer-aided design and drafting (CADD); law enforcement; heating, ventilation, and air conditioning (HVAC); and information technology (IT). Third, people should consider the cost of various kinds of educational institutions when they think about investment in education. For example, the average cost of attending a four-year public university (tuition, room, and board) from 2007 to 2011 was $58,623, while the average cost at a four-year private university for that same period was $125,604.7 Does that mean you should consider only public universities? No, but cost should be considered in making your decision. The ROI for a would-be elementary schoolteacher would be higher if he or she chose to attend a four-year public university. A firm invests in physical capital in an attempt to increase its revenue (income) and potential profit, but only after considering the return on investment. People might consider using a similar strategy when deciding whether and how to invest in their own human capital. 7 National Center for Education Statistics. "Fast Facts: Tuition Costs of Colleges and Universities." See http://nces.ed.gov/fastfacts/display.asp?id=76. Capital: Goods that have been produced and are used to produce other goods and services. They are used over and over again in the production process. Human capital: The knowledge and skills that people obtain through education, training, and experience. Investment: The purchase of physical capital goods (e.g., buildings, tools and equipment) that are used to produce goods and services. Investment in human capital: The efforts people put forth to acquire human capital. These efforts include education, training, and experience. Productivity: The ratio of output per worker per unit of time. Profit: The amount of revenue that remains after a business pays the costs of producing a good or service. Return on Investment (ROI): A performance measure of the effectiveness of an investment. ROI is calculated as the net gain (gain from investment minus cost of investment) divided by the cost of investment.